One month ago, Sherman Health announced a new Facebook contest: mustache-growing for men’s health awareness. Deanne wrote about the contest last week, and you can get contest details here, but for this post, I wanted to toot the horns of some mustache submitters who, because of their affiliation with Sherman, are not eligible to win prizes. All mustache scores below are out of a possible 10. The Man: Walter is Web Art Director and the man we rely on at Demi & Cooper for all things technology. As far as we know, Walter controls the Internet. If you told someone besides Walter to go reset the modem, we’d stare at you with a blank face until you went elsewhere. We literally need Walter to function. The Mustache: Luckily, Walter does not need his mustache to function. It’s nearly indistinguishable from his skin, which is not ideal. His lips are pursed in the photo above, implying he’s chewing something, he’s super creepy, or both. The hand on the chin tells us he’s thinking about something, most likely prunes. Also, the name he gave the photo (“You stay classy, Chicago”) reveals a close affiliation to the movie Anchorman, a film whose protagonist was #1 on our Top 5 Movie Mustaches list. The Man:Josh is Sherman’s Marketing Communications Manager, and a man with a quick wit and an open mind for any idea. His unmustachioed personality is one of the best we could hope to work with. The Mustache: The smirk is unsettling, as is the black background. This photo may have been taken in an underground lair. Extra credit goes to Josh for going for a creepy look and nailing it (he titled it “Not at all creepy”, which just made my sarcasm detector explode). The Man: Luke is me, and thus I will stop talking in the third person. I write things at Demi & Cooper, and I am newly married to a beautiful woman who is fully supportive outside of all things mustache. The Mustache: It’s in black and white not for stylistic purposes, but because of necessity: my mustache in living color is one of the most horrifying things you will ever witness. I said earlier Walter’s mustache is almost skin-colored, but that’s nothing compared to this. To properly explain, I recently described the mustache to a group of people who were wondering what it looked like as “fleshy”. Eww. I titled my submission “1950s blog author”, which is funny because blogs did not exist back then, you see. And just like that, I ruined the joke. The Man: Mark is also recently married, to Michelle, Marketing Specialist at Sherman. He is ineligible to win because of his wife’s ties to the contest. Dealbreaker? Dealbreaker. The Mustache: I cannot stress enough how much more awesome Mark’s mustache is than the previous three. We’re all friends here, so I’ll shoot straight. I’ve creeped on some of Mark’s Facebook photos. In my defense, whatever, man. Creeping happens. I had no idea that beneath his seemingly clean-cut exterior lay the perfect Hulkamania trucker mustache. 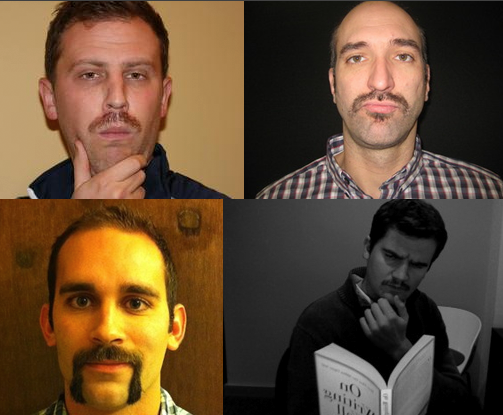 Want to vote in the Sherman Health Movember Mustache Contest? All you need is a Facebook profile. Click here to get started, and remember not to vote for Walter, Josh, Luke, or Mark.